Building on the existing body of international research, the findings of the Fostering Effective Early Learning (FEEL) study, address the need for quality improvement in ECEC by showing how a particular form of evidence-based in-service PD can produce substantial and practically meaningful improvements in both staff practices and child outcomes. The FEEL study was conducted by the research team from Early Start, University of Wollongong, on behalf on the NSW Department of Education. 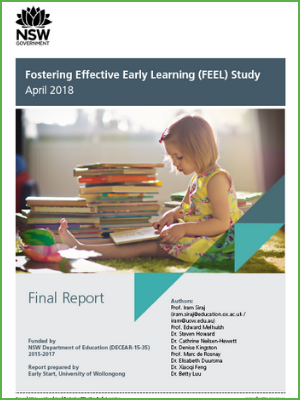 You may also find the The Fostering Effective Early Learning (FEEL) Study's Literature Review below. The Literature Review highlights the importance of quality teaching practice in early childhood education and outlining the key elements of the best practice professional development used in the Study.